A few of Beemiles’ founders went for a yacht week in Croatia this past July. 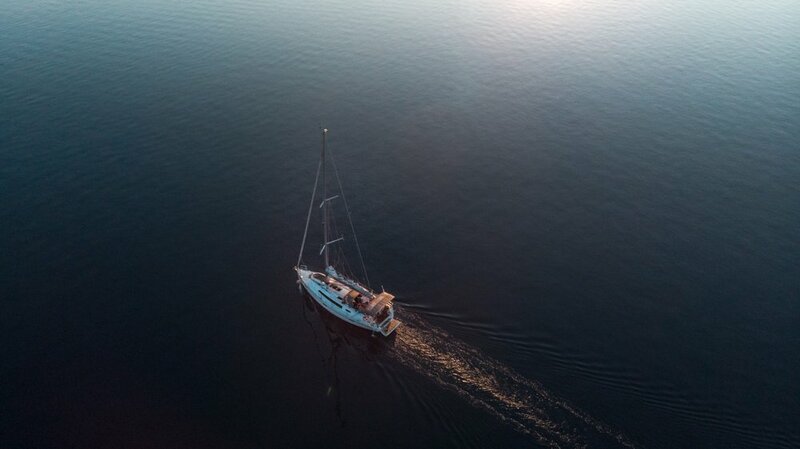 They rented a sailboat and spent a week discovering the Adriatic Sea, near the Croatian coast. Based on their experience, we’ve prepared some key recommendations for sailing in this fantastic area! You should definitely add sailing in Croatia to your bucket list! What is the best time of the year to go sailing in Croatia? Any time from June through September. July and August are high season, which is why prices are higher and it gets more crowded. September is ideal, it’s less crowded, the weather is good and the water is still quite warm. What is the ideal length for a sailing trip to Croatia? 2 weeks. You fall short with one week, especially if you want to make longer stops. What are the ocean and the weather like in Croatia? The water is incredibly clear, and a beautiful colour. During the summer, the weather is great: it is sunny, the water temperature is 25 ºC, and the sea is super calm. When it dawns, the wind is calm and it picks up during the day reaching 15 - 20 knots in the afternoon. At sunset, the wind slows down again. The wind is constant, and sailing conditions are ideal. It is usually very hot, and the sun is really strong. Near the islands, there are very few waves, but when you reach the open sea, there are more waves. You should be aware of storms and of the bura wind, which is quite unpredictable and can reach up to 200 km/h. It is advisable to speak to local people, to plan ahead where to spend the night, to find out what the safest harbours for different wind conditions are, and to be attentive of the weather forecast. Would you recommend hiring a skipper? If you’re not experienced, if you don’t feel safe sailing alone and if you prefer having someone with you that knows the area, it is advisable to hire a skipper. If you are hiring a boat without a skipper you should have experience with sailing in the ocean and with strong winds. Even though conditions are ideal in Croatia, they can easily change. The Croatian coast and nearby islands are very dry and have really high temperatures during the Summer. You should take enough drinkable water. Also make sure the sailboat you rent or hire has an awning to take refuge from the sun. What places are worth visiting? What are the average mooring costs in Croatia? Zadar, a city with narrow and picturesque streets. Eating calamari and listening to the hypnotizing sea organ are definitely musts while you’re there! Calamari is THE Croatian food. The sea organ is like an organ that works with the movement of the sea. The Kornati archipelago, that includes about 150 islands, is amazing! There you’ll find unbelievable landscapes. There are hundreds of bays, ruins, 80-meter-high cliffs that fall into the ocean, lighthouses... To access Kornati National Park you have to pay an entrance fee, it’s advisable to buy it online in advance or in any large city (Biograd, Zadar). Apparently you have to pay double price if you buy it on the spot. For our sailboat (41 feet) we were charged €200 for a 3-day pass, which also included access to Telaščica (a park located south of Dugi Otok) and the overnight fee for the bays. Distances are relatively short, which makes adjusting your plans easy. When we were there, we didn’t plan much ahead, we went to places we found interesting and stayed at bays that drew our attention. The Otok Lavsa and the Kruševica bay are great for spending the night. There are many spots where you can anchor and eat or have a drink at the restaurants that are on the coast. Generally you get to see old and very picturesque houses. What makes sailing in Croatia so special compared to other places? It is quite safe, the weather is stable, the distances between ports are short. The huge amount of islands makes it lots of fun! In one same day, you can see wild places in the middle of nowhere by yourself, and historic ports and towns, with their narrow streets filled with tourists. It’s really easy to stop, disembark, visit a place, then keep going. There are many wind protected bays, and many of them have buoys, so there’s no need to use an anchor. What other places are good to spend the night? We spent two nights at Biograd’s marina. If you rent a sailboat there, you’re allowed to anchor for free. It has great showers, hot water, electricity, and the historic city centre just 300 meters away. However, there are hundreds of boats around, it’s not the best option if you’re a nature/ solitude lover. We also stayed at Zadar, which also offers good services and is quite crowded. We had to pay, but half the price because we left before 7 am. The city is beautiful. Another option is Brbinj bay, which is in the middle of a beautiful natural landscape. There are available buoys and you have to pay to spend the night there. One of our favourite places to spend the night was a bay in Otok Lavsa Island. You need to be careful though, because waters are quite shallow. On the shore, there is a restaurant and containers for you to leave your rubbish. Kruševica Bay in Otok Pašman is yet another alternative: it has buoys, and on the coast there’s a restaurant with excellent food. When we were there, there were hundreds of boats. And lastly, one night we stayed at a bay in Telaščica, which was amazing, a very natural place. From there, there’s a nice walk to a lighthouse and you get to see impressive cliffs that fall to the Adriatic. It’s a great place to watch the sunset! 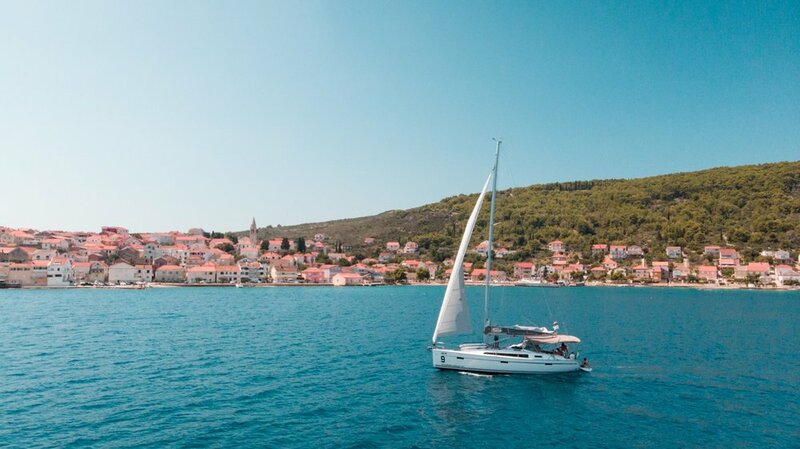 Sailing in Croatia on the Adriatic sea is an experience you will never forget! How did you work out your food? We bought food in advance to cook on board, the boat’s kitchen was great. We also went to the supermarket a couple of times, there are markets in all the big ports. We also fished, from the boat, moving slowly. We cooked some of the fish we caught on the boat, it was fantastic! We even saw dolphins, and our last day we fished a seagull…! What sailboat do you recommend? We rented a Bavaria 41 S, and it was a great choice, we couldn’t have picked a better boat. It’s super comfortable, it has enough space for 8 people, two toilets, wifi, electricity and plenty of space outside. It has a low fuel consumption. We turned the engine on only to charge the batteries, to get in and out of ports and for windless mornings. There are lots of good boats available: Elan Impression, Sun Odyssey, catamarans, etc. No matter what boat you rent, you definitely need to have a dinghy to go from the sailboat to the coast. It is generally included in the price you pay for the boat. What is the procedure to hire a boat? What are the requirements? It is very easy, you book and pay online. Once you pay, you complete the crew list (also online). When you’re in the marina, before receiving the boat, you present the boarding pass which the company emails you and the skippers’ documents. A € 1500 deposit is blocked for the insurance. You have to check the boat and sign a checklist which describes the state in which you receive it. To be able to rent a boat like the one we rented, at least one of the crew members needs to be a certified skipper. We were also asked to have a VHF license, but most people don’t have this. We didn’t and we simply signed a document which declared we didn’t have it. About € 2,300 for the week. But we were there at the most expensive time of the year. It’s much cheaper during the low season! We rented the boat at Adriatic Challenge, and are very satisfied with the service provided. On the whole, summing up the boat rental, the fuel, food, etc, we spent about €100 per person per day. It was worth every cent!